Present the loan receipt to our library staff at the counter and collect your gift pack! 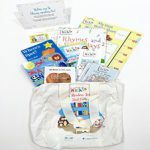 – The Baby gift pack contains 3 board books, Reading is Fun! Booklet, A Guide for Reading with Little Ones DVD, Height Chart and Rhymes and Fingerplays for Little Ones.